Can you imagine a network with 1000, 10.000 or even 100.000 members? About 5 years ago, I started to use this video. Watch it, it’s only a minute. Most of the people do not join an MLM network, because they can’t believe that they can make it. If you ever read my posts, watched my presentations, you know, that I think they are not numbers, they are real, living, breathing people. Not only is the numbers that matters, but how active are they, how often and regularly do they buy the DXN products. This is the result of a teamwork. Thanks to this and for the “One world, one market conception” our team is expanding worldwide. 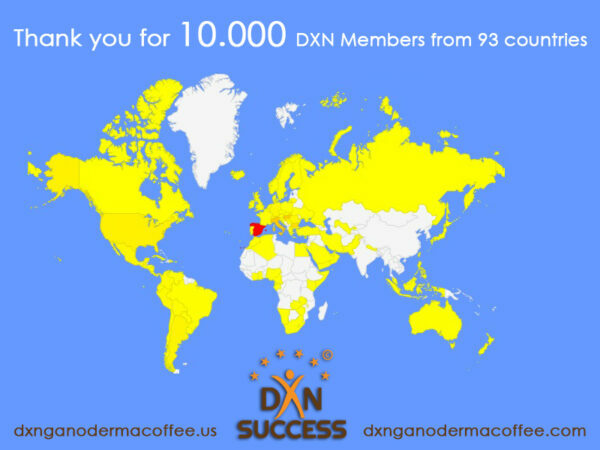 Today, our team has reached the number of 10,000 DXN Members worldwide! As you can see we have DXN members from 93 countries. I feel, that we have many possibilities to increase our team from all over the world. In our DXN Success Team, we have more than 30 diamonds, from 5 different lines, and soon we will have our 6. We have a big vision and goal to reach the highest level, and become DXN Crown Ambassador with 20 different DXN Diamond lines. We already know who will be our 7. diamond, but after this anything could happen. Some pf our teammembers are already on the “diamond-way”, but we can find anytime a new active member, who reach it shortly. This English Wordpress homepage: http://dxnganodermacoffee.us/ has 200-300 visitors daily. Of course not just new prospects, but other DXN members too. We would like to say thank you to all of our teammates, who are part of this success!